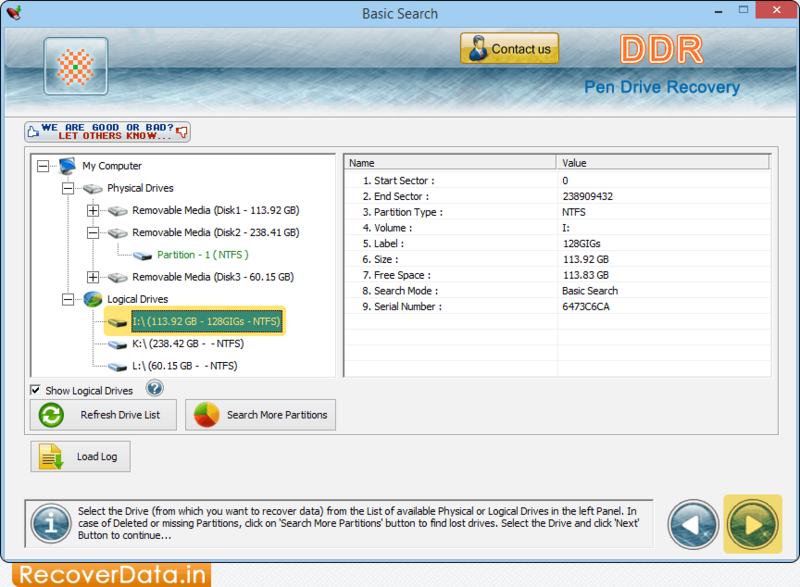 Pen Drive Data Recovery software retrieves all your lost data from corrupted or logically damaged USB drives. Data Recovery Software recovers lost files and folders from pen drive, flash drive, key drives and other types of USB drives. Pen Drive Data Recovery utility recovers files, folders, music, pictures, video, digital images, photos etc which is lost due to improper usage of drive, virus/worm attack, accidental corruption etc. Pen Drive Data Recovery program recovers files of bmp, mov, jpeg, tiff, mpeg, wav and other extensions. Data Recovery Software restores data lost due to quick format, damaged file system, Human errors, improper shutdown or any other type of software or hardware failure. Recovers lost files and folders due to human error or any virus generated data loss. Recovers data even if “drive not formatted” error message is displayed on your computer. Support all brands of pen drives including Apacer, Kingmax, Lexar, Kingston, Transcend, Nikon, Super Flash, Sony, Fujifilm, Corsair, Samsung etc.